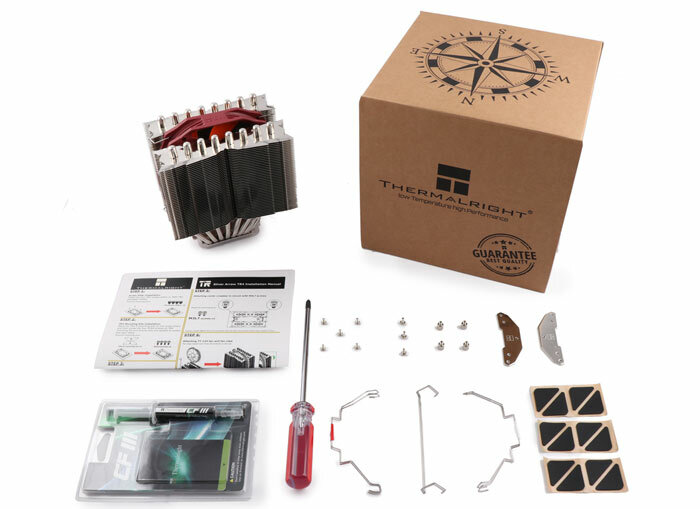 Thermalright has launched a new air cooler for AMD Socket TR4. This 140mm fan cooled twin tower unit is therefore intended for cooling your AMD Threadripper / Epyc CPUs with the large contact surface necessary to match these CPUs and TR4 mounting kits. 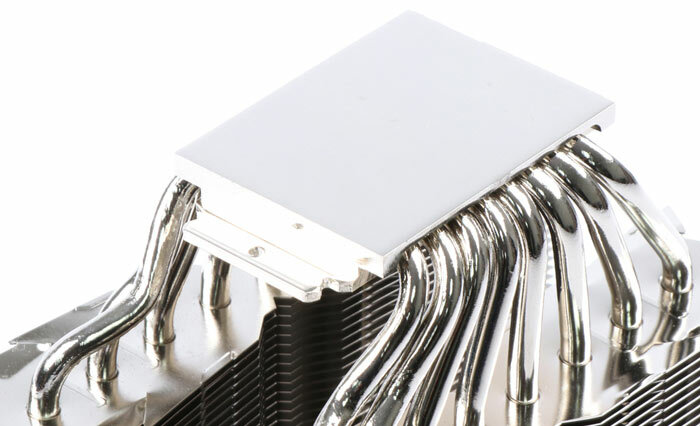 According to the specs, the Silver Arrow TR4 is capable of cooling the beefiest of the upcoming AMD processors, even the top end 24-core and 32-core Threadripper 2 models (250W TDP). 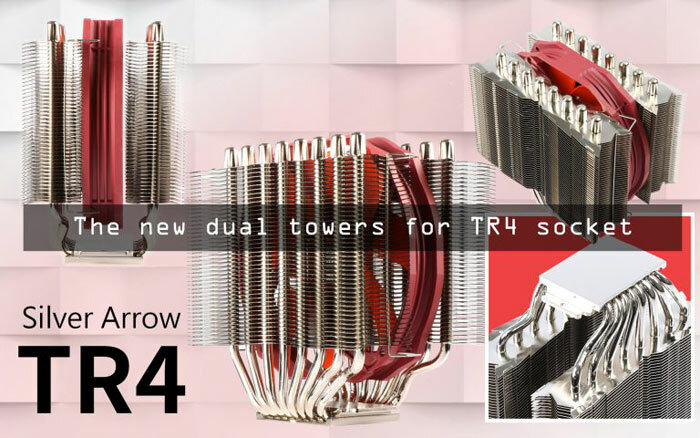 Thermalright has designed the Silver Arrow TR4 to provide no obstruction to the top PCIe slot on motherboards, a common malady with twin tower coolers. Buyers will receive a syringe of Thermalright's Chill Factor III thermal compound and benefit from a two year warranty. Pricing is yet to be revealed. As linked to above, we saw the 32 and 24-core Threadripper 2 models launched at Computex 2018. However, we didn't get a specific release date at that time. Today, Guru3D claims, citing Chinese sources, that the "Ryzen Threadripper 2990X and the Ryzen Threadripper 2950X" will be released on Monday, 13th August. These are the 32 and 24-core Threadripper 2 models, respectively. Existing X399 motherboards will support the new CPUs after a BIOS update. Ladling another layer of rumour on top of the release date, the pricing of the 32 and 24-core Threadripper CPUs is expected to be approx US$1,500 and US$1,150 respectively. Existing X399 motherboards will support the new CPUs after a BIOS update. Does anyone know if all existing motherboards can supply enough juice for the 250W CPUs? I've read that they *should* be able to without overclocking, but some will fall short if you do want to overclock. I've heard the same. It will depend on the mobo you have. Some will have larger tolerances than others but they generally weren't designed to deliver this level of pixies constantly. I expect that most will fall short for constant power delivery and almost all will struggle with overlocking and delivering max oomph over the long term. That's what I'm concerned about - the constant delivery over long term. I regularly max out my 1900x for long periods (1-2 hours), so I'd hate for a, say, 2990x to be power-throttling during that period (granted, it won't be for as long). Given the lack of concrete information, we'll just have to wait for the CPU support lists and reviews to come out. I tried contacting Gigabyte about the X399 Designaire Ex, but they couldn't help.